More funding for safe streets in City Budget. Thank you! Here’s something to be thankful for today: Seattle City Council passed the final version of the 2017 budget with some fantastic improvements thanks to your support! $1 million to fix Rainier Ave S – the most dangerous street in the city, and an acceleration of funding for the exciting Accessible Mt Baker project. Funding to create a North Beacon Hill Multimodal Transportation Study to allow much needed safety and community building projects to move forward. Moving up the Bicycle Master Plan (Cascade Bicycle Club led the charge on this!) and Pedestrian Master Plan spending so we can design and build more safe streets sooner. Additional funding for Safe Routes to School ($400,000 from red light cameras). Directing SDOT to use best practices for streetcar & bike collision safety. Other great improvements to the budget: Funding to conduct a condition assessment of Seattle’s $5.3 billion sidewalk system to support smart investments in sidewalk repairs, a new grant writer position to help SDOT leverage Move Seattle funding, and a section of sidewalk for the Meadowbrook neighborhood. We wouldn’t have these successes without your calls, testimony, and letters! It’s caring people like you who make a difference in our world. Thank you. If you can take a minute to thank our elected officials who listened to you, please email council@seattle.gov and thank them. Below is a sample email. 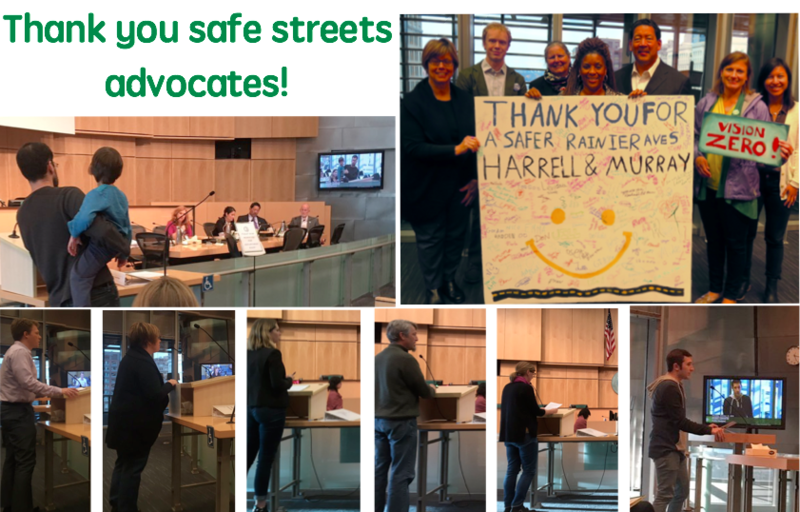 Council President Bruce Harrell for funding to fix Rainier Ave S, accelerate Accessible Mt Baker, and plan for a safe Beacon Hill Town Center. Councilmember Mike O’Brien for the sidewalk assessment, SDOT grant writer, streetcar safety SLI, and accelerating the Bicycle Master Plan. Councilmember Debora Juarez for a Meadowbrook sidewalk. Councilmember Johnson for supporting many of these transportation budget additions. Thank you for your leadership in making our streets safer for all people. Please consider a gift to Seattle Neighborhood Greenways if you want to support our successful, reliable, and impactful advocacy in 2017. Thank you.